Historic Markington Hall, located in the small village of Markington has origins dating back to 1066 and nestles in the beautiful countryside of North Yorkshire. It is the home of the Wilberforce family, the direct descendants of William Wilberforce, famous for campaigning for the abolition of slavery in all the English dominions of 1833. The owners William & Julie are offering part of the grounds as a family orientated ‘glamping’ site, named Copper Beech Glade and featuring a trio of romantic bow top gypsy caravans the Wilberforce high degree of hospitality and an emphasis on fun. 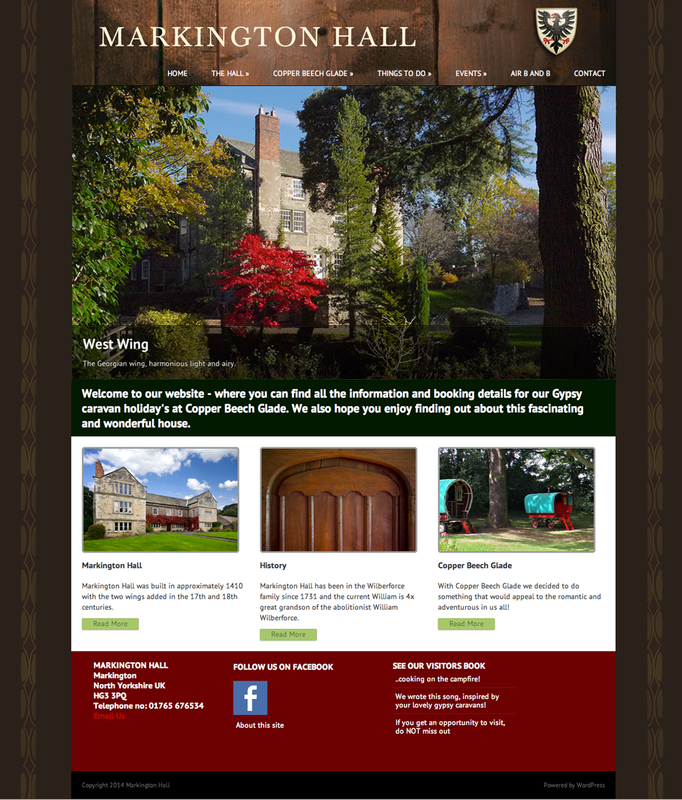 They asked me to design a website to celebrate the Hall, it’s history, the Wilberforce family history and promote all aspects of Copper Beech Glade including camping information, online booking and payment and lots of resources and suggestions of things to do in the surrounding area for its visitors, during their stay.